It seems strange to say, but I look forward to Mondays. It’s not that I’m excited about getting the kids back to school or the beginning of the work week. I don’t go anywhere special on Mondays and usually spend the day at home working and cleaning. My excitement builds throughout the day and culminates at 9pm ET. Why? Easy answer. That is when the next episode of the CBC family drama, This Life, airs! During these one hour episodes, you’ll find me in my living room, with a comfy blanket and a snack, engrossed with the latest episode. There’s no other place I’d rather be! I haven’t enjoyed a Canadian program this much since the days of Degrassi High back in the late 80’s and early 90’s. Coincidentally, it was also on Monday nights. It’s not a stretch for me to say that This Life is my favourite show on TV right now. I’ve been telling my friends and family to watch so they can see exactly what I’m talking about. Several of my friends have started watching after my recommendation and they understand now what all my hype was about. This Life is heartwarming, poignant and real. There isn’t one thing I don’t like about the show. On Thanksgiving weekend, I shared my list of 5 things I learned from This Life. As you’ll see after reading the post, I was a fan from the very first episode. One question I often get asked by my friends and family who haven’t seen the show is WHY do I love it so much? What sets this show apart from the others on TV? I had to think for a minute to come up with a proper answer beyond, “It just is and you should watch it”. I know they were looking for me to elaborate so that’s what I plan to do AND I’m sharing it with all of you, too. So why do I enjoy watching This Life so much? Here are several of my reasons. 1. It’s powerful and moving. Each episode brings out a range of emotions. I can be sad one minute and giggling in the next. Most importantly, the storyline and characters have the elusive power to touch my soul and make me feel for the characters and whatever the situation is. I giggled at Maggie and Oliver’s antics (remember Huffy Puffy?) and cried when Oliver came clean with his family about Tom’s death. I felt Natalie’s frustration with her 13 year old daughter, Romy, and her lack of enthusiasm for the therapy sessions. A TV show is good to me if it can make me FEEL and not just keep me entertained. This Life happens to do both. 2. It reminds me that no one is perfect. Perfection is not attainable no matter how hard you try. People make mistakes, even good people. The characters on This Life are all good people that are easy to love. However, they have their faults just like all of us do. Tempers flare and anger can get out of control like in the domestic violence situation with Caleb and Ariel. Matthew had an affair and has a child his wife doesn’t know about. Danielle is sleeping with her best friend’s son. Just because I don’t necessarily agree with these choices doesn’t make me dislike the characters. Instead, it makes me like them more because they are human, with flaws, secrets and all. 3. It’s focus is on the importance of family. 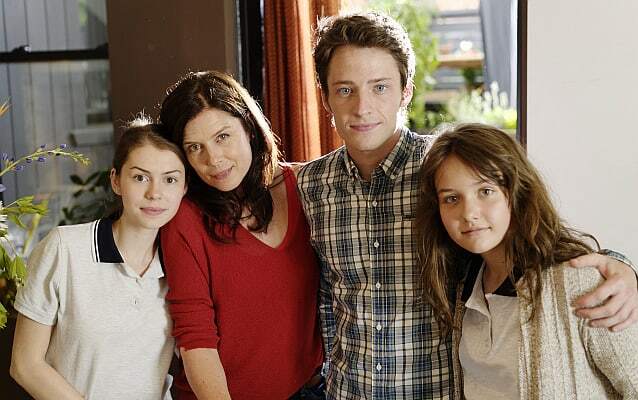 The storyline revolves around the characters in Natalie’s immediate and extended family. I enjoy watching them pull together to help one another when times are tough. Remember Gerald giving his son, Oliver, $200 just because? Oliver didn’t have to ask his dad for money. Instead, Gerald knew. That’s what family is about to me: lending a hand when someone needs it. Maggie flying out to LA with Oliver to help him settle the estate legal issues with Tom’s son was another example of the strong family bond. It was cool to see her stand up for her brother in her quirky Maggie way and turned the entire situation around to something positive. 4. It reflects that relationships are not one size fits all. Oliver is gay, Natalie is divorced and dating her daughters’ principal and Maggie has some kind love triangle thing going on with a couple. I think of the recent quote from our new prime minister and how it could be applies to this show. “Because it’s 2015” shows that times are changing, relationships, that once had to be hidden, are out in the open. It’s about what works for the individual. They don’t have to fit into a traditional mould for it to work. It’s whatever works for the people in the relationship that matters and it’s refreshing to watch. Love comes in all shapes and sizes! The season finale of This Life airs on December 14th at 9 pm EST. I hope you’ll join me and tune in to watch! How will Natalie handle her ex-husband’s return and what will happen with Matthew and Nicole’s marriage? Tune into the finale to find out! Catch up on This Life by watching the episodes you missed online. Then, on Monday night, tune in at 9pm EST for the finale. Do you watch This Life? If so, what do you love about the show? Hmmm, I wonder if we get this at all down here in the US. It sounds like a GREAT show. I am looking for a new series to start! This looks perfect! Streaming soon! Thanks for posting this, I look forward to watching it, looks very interesting and I am in need of a new show to watch! This Life sounds like a great show. I’ve never seen it before, but I’ll definitely give it a try. I have a friend who loves this show. She’s been after me for a while now to watch it. I’ll have to give it a try! Sounds like a show they should play here in the states. Most of the shows here are not all that good! I’ve been looking for a new show to watch as nothing has really caught me lately…I’ll have to see if we get this here in the US! I have not heard of this show before. It sounds like a great show. Ill have to check it out. I haven’t even heard of The Life until now. Looks really good! I’m always looking for a new show to stream! I have seen the ads for the show but have never watched it. Your post has persuaded me to watch it when I get a chance. It certainly seems interesting and I am looking forward to watching it. This is a show I’ve never heard of! I’m going to have to check the local listings and see if I can catch and episode! I’ve never seen or heard of this show. I’ll have to check it out. It sounds very interesting. I’m sure I’ll enjoy it. I love that the show focuses on family. That means a lot to me. I am going to check this out. I was a degrassi watcher, as well. HA! This show sounds pretty good to me. Thanks for the info. I have not seen This Life yet. I will have to watch it this weekend. It sounds like a great show. This sounds like a great show with some situations and themes that are true to life. I bet I’d love this program. I have not heard of the show This Life before! This sounds like a great show, I love ones that focus on family life! sounds like an awesome show. i really think that i would like it. i wonder do they have this show here. This sounds like a great show. I haven’t heard of this until now. I would love to watch this. I haven’t watched this yet. I have heard a lot of great things so I should start!